Have you ever noticed how when the rain stops and you forget to turn your wipers off and they start making a loud speak as they slide across the windshield? Yeah, that means you need new ones. Wiper blades wear out from use and being out in the sun. It means they don't clean as well so you'll see streaks; plus dirt and dust are just harder to get off. EzWipers.com sent me a pair of wipers to try and to be honest, there's not much to say because they just carry top quality products. 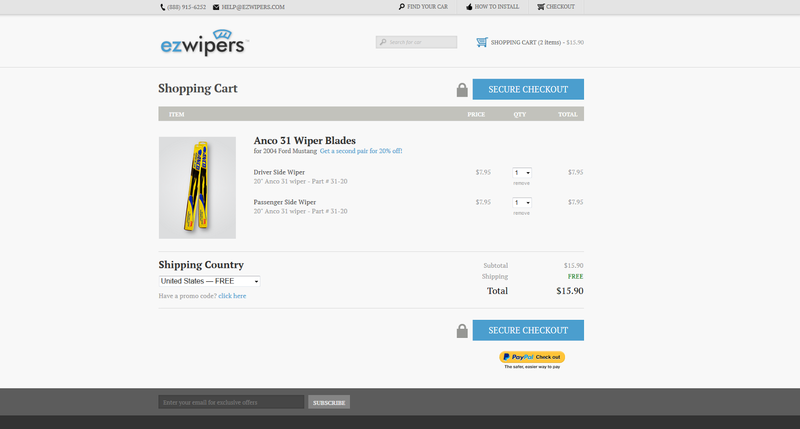 If you've ever see wipers for sale you'll recognize the names like Rain-x and ANCO. Of course these perform just as great as the ones you'll find anywhere else. The thing is most people don't even think about replacing the blades when needed. They just leave them and after a while think all blades leave streaks and make noise. I know I sound a little ridiculous but sometimes lazy people like me just appreciate something simple. The hardest part is just getting out and checking the blades for the size or searching around online to find which ones fit but guess what; I've never seen it easier that EZ-wipers. I went on the site, the big box in the middle auto completed the name of my car, and I was met with a range of prices. Add to cart and the checkout even accepts a range of payments including Paypal. The best part is the free shipping. Do yourself a favor and get over to the site and have a clearer windshield now. There's really no excuse to get new wipers in the mail in the next 15 minutes. I received this product free in exchange for nothing more than my honest opinion.